Last year, Visit Charlotte, the sales and marketing component of the Charlotte Regional Visitors Authority, kicked off a brilliant marketing campaign called "Charlotte's Got a Lot." You've probably seen the advertisements and billboards around town. And to exemplify all there is to experience here, the group has selected "25 Fun Things to Do in Charlotte," just in time for you to get out and enjoy them during this warm weather. Below are the top ten. 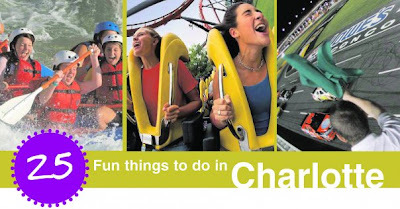 Visit Charlottesgotalot.com for the complete list of Charlotte activities as well as other details about attractions, nightlife, shopping, and dining in the Queen City.